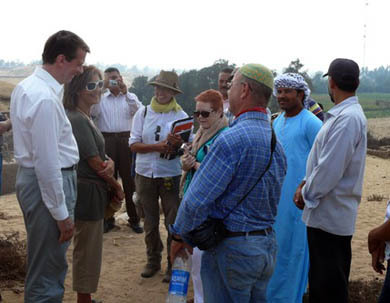 I have just returned from my fifth visit to Egypt as EES Director, and will be back again in a week or so. It hardly needs saying but being in Egypt, ensuring that we do everything we can to achieve our aims in Egypt, is a top priority of mine. One of the essences of the work my colleagues and I have been doing recently is to ensure that we are clear about what we want to do, and that we revise our activities where necessary so that the resources we have are put towards achieving those aims most effectively. By and large our efforts have focussed on the UK (for good reasons); we’re doing what we can to extend our reach (see here, under ‘New audiences’) but Egypt also requires particular attention of course. 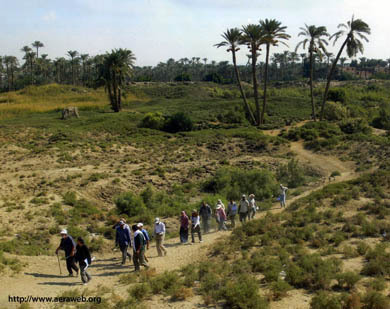 In my view, aside from field research, we have not been doing enough in Egypt in the last few years. Fortunately, there is currently great enthusiasm for us to change this situation. Every one of my recent visits has been enormously instructive, useful and enjoyable. I have made a point of trying to meet as many friends and colleagues as possible, to talk to them about the situation in Egypt generally, and with specific reference to archaeology. I have spent a lot of time talking to colleagues at the Ministry of Antiquities, trying to find out how we might be able to help, and how our aims might fit with what is needed in Egypt at the moment. I have also had several extremely useful discussions with colleagues at the the Egyptian Museum and Grand Egyptian Museum (GEM), the British Embassy and British Council, the American Research Center in Egypt, and elsewhere. I have learnt that the EES’ profile is low – much too low – even amongst the archaeological and British expat communities. Despite this, however, I have also learnt that there is an enormous appetite for us to offer more, and much optimism that we can achieve this. Many view the Society as a sleeping giant in fact, an organisation with a great and glorious past that could hit the heights again if it chooses to do so. Delegates at SOAS after the ‘Forming Material Egypt’ conference in May 2013. 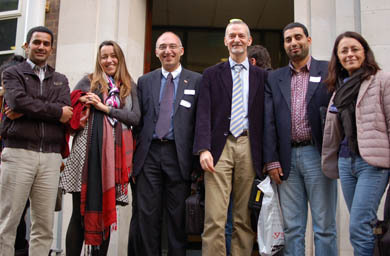 L-R: Abdelrazek El-Naggar, Alexandra Villing, Tarek Tawfik, Stephen Quirke, Maher Eisa and Daniela Picchi. 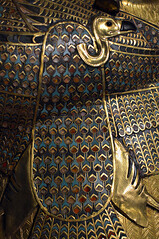 The recent ‘Forming Material Egypt’ conference organised principally by Professor Stephen Quirke of the Institute of Archaeology at UCL, offered an additional opportunity for discussion – of some of the practical issues relating to the survival of ancient Egyptian material in Egypt and dispersal to Museum collections around the world, and how, in post-revolutionary Egypt, we might work together more effectively to tackle these issues. The Society helped to provide the funding needed to bring three specialists over from Egypt – Drs Maher Eisa and Abdelrazek El-Naggar from Fayoum University, and Professor Tarek Tawfik from Cairo University – whose leadership of the discussions was invaluable in making the conference a success. In general, these discussions suggest that the Society can be most useful in providing education and training – in the skills that will best equip the next generation of archaeologists and Egyptologists to look after the country’s history and heritage. Here are a few ways in which we are already responding to this challenge. As part of a thorough ‘organisational review’ we have taken the opportunity to review the activities of the Cairo office and to ask ourselves if there is anything more we could do. Make no mistake, having a member of staff and a permanent base in Cairo presents us with a fabulous opportunity. No other British archaeological institution has either staff or a base in Egypt; I feel wonderfully privileged to be working for an organisation that has these things at its disposal but also very aware of the responsibility to make good use of this opportunity. As we announced recently the Society’s Cairo Representative of the last six years, Mrs Faten Saleh, will be retiring in a few weeks’ time and we are very sorry to be losing her. Faten has been invaluable to us in facilitating the work of our research projects (and several others affiliated to other organisations), maintaining our network of contacts particularly at the Ministry of Antiquities, distributing our publications, and maintaining our programme of lectures, trips and other activities for members. 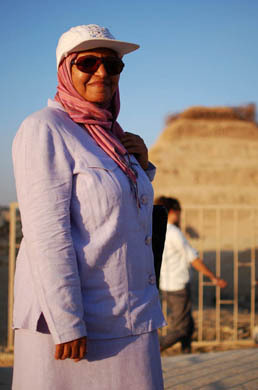 She has also been our ‘eyes and ears’ in Cairo, a constant source of valuable information about the situation in Egypt particularly since the revolution of January 2011 and it is no small part due to her efforts that our activities have continued almost entirely uninterrupted during this time. We have now created a new post of ‘Fieldwork and Engagement Manager’ to run the Cairo office and Faten’s successor in this new role will be Essam Nagy. 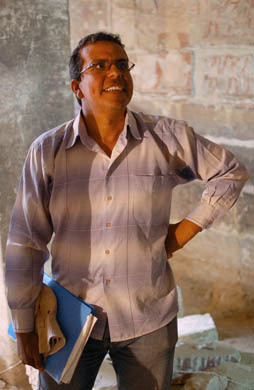 Essam has been working as an MSA Inspector at Karnak for the last few years and has also worked in the tourist industry which gives him a good blend of experience of both professional Egyptology and archaeology and the workings of the Ministry, and also of more commercial and public-facing work. My colleagues and I are very much looking forward to working with him. The new post will be full-time where previously it was part-time, in recognition of our ambition to do more. Facilitating the work of our field teams will remain a central part of the new role but it is in the area of ‘engagement’ that we particularly want to develop things. We want to develop our programme of educational events, placing less emphasis on the didactic and purely academic, and more on discussion and the practical. In the past, our events in both the UK and Egypt have been intended to provide things that will be of interest to people, on a purely intellectual level. In Egypt however we have the opportunity to provide workshops, seminars and training which will be of practical use, as a greater proportion of our potential audience will be able to take what they have learnt to the sites, monuments and museums where they are working. We need to be more active in seeking out the audiences that might benefit from what we have to offer, to establish what would be useful and then to tailor elements of the programme accordingly. We want to place less emphasis on the traditional lectures and more on events that stimulate discussion, such as seminars and workshops. The opportunity for colleagues, students and others to attend such events not only for what they can learn but what they can contribute can be a powerful incentive. With more events of this kind we stand not only to increase participation but also the number of expert voices as well, making them doubly beneficial. Lectures are proportionally much less important to our programme of events in the UK than they used to be. When I first arrived at the EES in 2001 this was the only kind of event we put on. Today the programme is much more diverse, and one of the ways in which it has changed it has that it offers more opportunity to those attending to get involved. We run many more events now and they often involve smaller audiences which creates a greater intimacy and encourages – we hope – more contributions from audience members. When we do organise lectures of the traditional kind we are careful to ensure that we run several altogether in a single day and to build social activities into these events to allow participants to discuss what they have heard with the speakers and with each other (such as at our forthcoming study day on ‘Palaces and Residences in ancient Egypt’). I feel that is now urgent that we bring this emphasis on participation – engagement – to the programme of events in Egypt. Attendances at the Cairo lectures have been lower than we would like lately and we must do everything we can to encourage the participation in greater numbers. The successful series of Delta Workshops organised by my predecessor, Dr Patricia Spencer, ably assisted by Faten and others, provides a model for the kind of event we might try to stage more frequently in future. The three workshops held so far, in 2009, 2011 and 2013 have been very well attended, by colleagues from all over the world and especially from Egypt of course, providing a platform for sharing knowledge between colleagues and the opportunity to build networks of contacts. There is a great potential synergy between the events programme run by the Cairo Office and the training opportunities our field teams now offer on a regular basis. With several teams in the field we are regularly sending dozens of specialists out to Egypt and increasingly we are making use of their talents not only to pursue our research objectives but also to offer the benefit of their practical experience in the form of tuition in archaeological techniques through the ‘field school’ model. Students at Quesna begin to trowel back an area in the Ptolemaic and Roman cemetery during the 2012 field school. 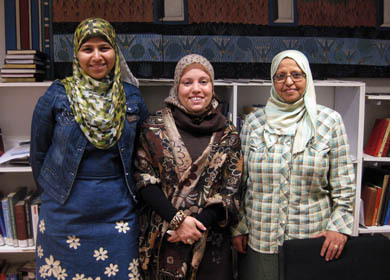 At Quesna, Dr Joanne Rowland has run an extensive training programme in collaboration with the University of Minufiyeh and the Freie Universitaet Berlin for local students and inspectors for the last two years. * The school incorporates not only ‘hand-on’ training in archaeological drawing, photography, survey, finds recording and ceramics, but also site management and desk-based work on study and publication. 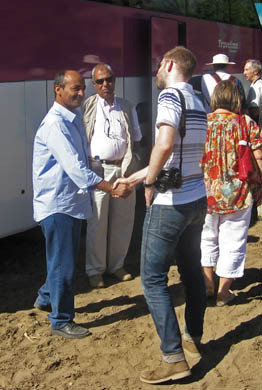 Similarly at Tell Basta, Dr Eva Lange and her colleagues have coached several trainee archaeologists in a wide variety of techniques and Dr David Jeffreys, Director of the Society’s of Memphis, was among the tutors at the Mit Rahina (Memphis) Field School run in 2011 in collaboration with the MSA, ARCE and Ancient Egypt Research Associates (AERA). A second, advanced training school will be run at the site this autumn, if permissions are forthcoming, and Dr Jeffreys and other members of the EES’ team will again play a major role. Another way in which the Society can be of direct assistance to our colleagues at the Ministry of Antiquities is through the provision of English language tuition through our association with the British Council in whose premises in the Agouza district of Cairo our office is located. In response to a request from the Ministry we were able to provide two of their employees with places on the Council’s English courses from January this year. Thanks to the generosity of the Council’s Egypt Director, Mark Stephens, with whom I have had several very useful and interesting conversations lately, we will be extending the offer to a further five MSA employees from September 2013. One unhappy consequence of the (rising) cost of publishing research in traditional printed form is that in some cases our reports have become relatively expensive to buy, and therefore inaccessible to some, to a certain extent defeating the object of publishing i.e. making the information publicly accessible. This problem is particularly acute in Egypt where people are less wealthy, and the difficulty and cost of importing Egyptology titles makes building a library almost impossible. In time, the advent the digital revolution may prove to be something of a leveller, making access to published Egyptology as easy for Egyptians as for anyone else but for now a lack of infrastructure and resources means access to the relevant content is restricted to a small minority. In any case Egyptology has not yet completely embraced the digital revolution and a significant proportion of content is still available in printed form only. We have always taken steps to ensure that copies of our titles are available in Egypt. We are required to provide the Ministry with five copies of everything we publish as a condition of receiving permission to work in the field, and we have always made our titles available for purchase at the Cairo office. We are now making a concerted effort to make our books more widely available however. We are beginning to ship excess stock to Cairo with a view to providing copies free of charge to certain libraries and institutions which don’t have the resources to purchase them. 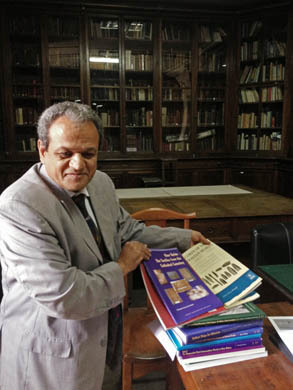 I was somewhat surprised and dismayed recently to find that the library of the Egyptian Museum, one of the most prestigious Egyptology libraries in the world which is entered via a grand doorway to the left of the main entrance of the Museum itself, contains very few EES titles from the last few years. I’m very pleased to say that we have already started to put this right, thanks to the efforts of Faten Saleh, who arranged for the transfer of an initial shipment of titles from the Cairo office. Following a very productive meeting with the Director of the Library Mr Magdy Khalifa two weeks ago I am determined that we should try to provide more for his collection and that we should extend this initiative to other libraries as well. Every year the Society provides support for young Egyptologists through the Centenary Awards – grants provided to small-scale research projects with discreet, distinctly achievable aims. 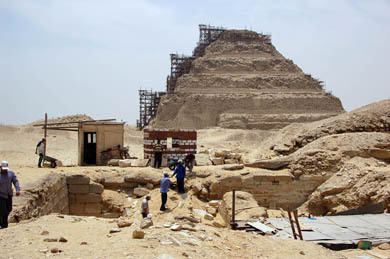 It seems particularly appropriate given the mood of change among colleagues in the archaeological community in Egypt that one of two grants made this year went to an Egyptian archaeologist, Hany El-Tayeb, for his work on the Old Kingdom mastaba tomb of a man called Rashepses. The money provided by the Society through the Centenary Fund was the only financial support available to Hany this year; the funds provided to him previously by the Ministry of Antiquities have had to be withdrawn due to budgetary constraints following the revolution. I visited Hany’s project with the Chair of the Society’s Trustees, Dr Aidan Dodson and his wife, Dyan, at the beginning of this month. The tomb was first recorded by Lepsius, then lost until it was re-excavated by Quibell in the first years of the 20th century, then buried underneath the sands again. 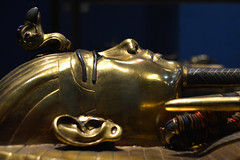 Not only has Hany rediscovered the tomb, he has also uncovered a number of chambers not known to the earlier excavators, neither of whom recorded the decoration in any detail. Hany is conducting the first thorough excavation of this important monument and will in due course record and publish the splendid painted reliefs that cover the walls. Until that time, I cannot show you any photographs and you will have to take my word for it: the decoration and its state of preservation is quite breathtaking in places. 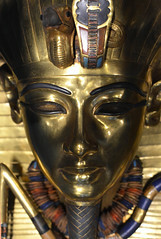 We are hoping that the first publication of the project will appear in Egyptian Archaeology in the coming months. Aidan and I were delighted and proud at the Society’s association with Hany’s work. Without the EES’ support the work could not have taken place at all. 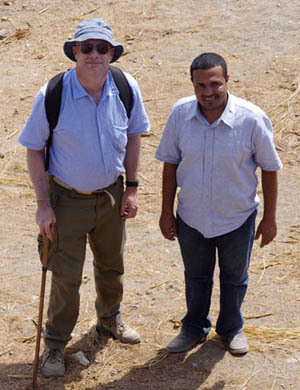 This is (to my knowledge) the first time we have been able to support an entirely Egyptian-led project in the field, and we both thought it particularly appropriate that it was for work at Saqqara, the site of so many of the Society’s most significant discoveries such as the Sacred Animal Necropolis and the tombs of Horemheb and Maya. Egypt is a much-changed country since the revolution. The challenges of looking after such an incredibly rich historical legacy and inheritance are numerous and extensive, especially given the many other issues confronting the country and its people. There seems, however, to be a great optimism and renewed willingness to discuss openly the challenges faced, and there is certainly a great enthusiasm at the Society that we should play a part in helping to meet these challenges. I hope you will agree that we’re taking steps in the right direction. **This sentence edited 9 June to add collaborators’ names. **Further photos from my most recent trip to Egypt, including my visit to Hany El-Tayeb’s work at Saqqara, are here; more photos from the ‘Forming Material Egypt’ conference are here.